The robin that I blogged about earlier this week is now a proud parent! Either three or four eggs hatched and mom and dad are busy feeding the hungry nestlings. After only two or three minutes she flew off. A couple minutes later either she or the dad (both have rather dark heads) returned and fed two of the nestlings. Great find. Look forward to ongoing photos of the proud parents and babies! So glad to hear about your robins becoming parents! YEAH! You seem to have the nack for getting close-up pictures.-Nicely done! i found a baby robin in my yard that the parents have left for one reason or another,i left it alone for a couple of days,and just watch it,no return of the parents so i brought it in the house and started feeding it night crawlers its up to a dozen night crawlers aday,and thinks iam its mom,its doing verywell on its diet of worms and starting to fly,the question is should i release it back to its enviorment?or continue to feed it. @Andy: I would do a google search for wildlife rehabbers near your location and ask them…if you can’t find one, make sure the robin has the ability to pick up food and eat it without your help (maybe by half-burying a worm and seeing if it pulls it out?). If the bird can feed itself and fly it should be okay. It’s good that you watched for the return of the parents, but I have a feeling that they might have been sneaking in and feeding the young bird when your back was turned as I imagine an unfed baby bird would probably have died pretty quickly. For the record, it is usually advisable to leave young birds where they are unless they are in imminent danger (in the road, being stalked by a cat). If they are very small and haven’t developed feathers yet it is advisable to try to return them to the nest if you can find it. But good going and I bet that your experience has been wonderful! I love all animals and I watch 41 nests on may 16 it was a cold day and 2 baby robins fell out of there nest I watched them it was drizzling and they were wet and scared my dad did not want me to bring them in the mom and dad robin were mad I can speak dove and pigeon but I cant speak robin what should I do we could not get them back into the nest. My friend and I found (what we think is a robin) egg on the ground by a tree. We took it in the house and made like a home made incubater(Tuperware contaner-napkinz-heating pad). The very next morning (w/ the incubater on low) the egg hatched! Now we have a small newborn baby (what we think it is) Robin. We now have to feed it every 10 or so mins( if it will eat). We found earth worms today and last night. So we are chopping them up putting them in water then taking them out with tweezers, whistling until it opens up his mouth, and he takes it and eats it! Hopefully “Robin” will be healthy enough for us to release him back to his natural environment. @Cathy: Put is back in the nest…and don’t worry about gloves, the parents will not reject their young. I just checked the spot where it was and its gone…there were 2 eggs that hatched…..I checked the nest and the second is gone too…is it possible they were ready to leave the nest. A baby robin fell out of his nest (at work) so I brought him home. I have been feeding him now for about 6 weeks, he is doing really well. He comes and goes as he pleases, but always comes to my special whistle and is always hungry. I have been feeding him meal worms, baby food, and occassionally dried cranberries. All of which he loves. I have noticed that he has something wrong with one of his feet. It appears to be swollen or tumor like in appearance around the toes, and also seems to bother him. He tucks it up under his breast while he sits and gets feed. Any idea what this might be? i had saved a baby robin from a cat. it can’t fly yet, and there are too many cats around to have left it out for the parents to come care for it. i have know place to take it , and know nowhow on how to care for it! please reply! @Autumn: Do a google search for wildlife rehabbers in your area, or look up the local audubon society (they often know who to refer you to). A pair of Robins built a nest on top of my air conditioner, which is protected from above byh the upstairs apt. deck and one side wall of the building. After I was sure the babies were grown and gone I was goine to put a fake owl on my patio so the birds would not return. My problem is that there are still Robins using the nest every day. Are these the babies still coming home to roost, or another set of parents using the nest to start another family? I am not real pleased to have them there because I disturb them every time I open the patio door, and the way my apartment is configured if I use the main building door that also disturbs them. If this is going to be a new family I will wait to put out my owl, but if they are the first babies maybe they can be encouraged to move elsewhere. 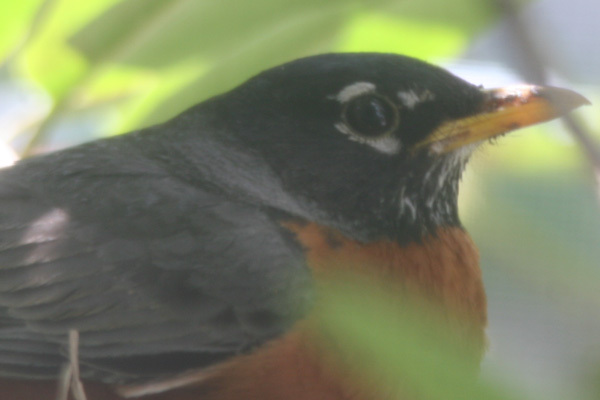 @Margi: It might be that the adults are starting a 2nd nesting attempt, though robins usually (I think) use a different nesting site for attempt #2. You can go ahead and put out the fake owl though, because they don’t work anyway. I have seen birds perch ON fake owls. We have a nest of 4 baby robins outside our bedroom window. We have been watching them since they first hatched and have enjoyed seeing them grow. Today I went for a peek and one of the birds fell out of the nest! I jumped back and left it alone, but two minutes later I went to see where it had hopped and was going to return it to the nest and it vanished. I have looked through every bush and grassy area but see no sign of it. Would it have been picked up by another animal so quickly? I feel horrible and am very worried that it’s parents will not be able to find it. I know the babies are close to leaving the nest and when it fell out it flapped its wings pretty good. If it is somewhere close by, how will the parents know where it is and do they continue to feed it and the babies in the nest too?? @Jayne: Adult robins will hear the fledgling call and continue to feed it, if it wasn’t predated upon. And don’t feel horrible: even if it was eaten that’s how nature works. There are lots of robins. Hi, a nest of robins fell from its spot on a deck to the air conditioner that is below of it. I came hoem and was notified of this, and also that there was a baby robin (we think, as there are blue egg pieces around) on the floor. The baby bird was apparently cold and it was chirping, so i put it in with its siblings. I attempted to move the nest back up under the deck, but I am afraid it may tip and fall over. Also, there are a lot of cats/squirrels around, so it was not safe to leave on the A/C. And, we think that a squirrel may have moved it, as my mother noticed one on the wall of the house climbing, and a cat was in the grass, so they must have been up to no good. I am afraid that they parents would have deserted their babies because of predators. Just the other day, I found a nest with five robin eggs in it. will be ok. I love all types of feathered friends. Please reply. @Tina: Sometimes birds abandon nests. Sometimes they are killed away from the nest. I don’t know exactly what you are looking for in a reply, but I wouldn’t recommend trying to raise five robins from eggs. This evening, the cat brought home a baby Robin. I like this site. The other folks who found Robins said they fed them worms. I will feed my little friend worms until he’s strong enough to fly away. Today it was pretty windy here and a nest fell out of the tree. I believe it was a robins nest, there were 3 babies scattered all over the lawn, I picked up the 2 of them. They were getting eaten by ants so I did have to touch them to pull them off. And the 3rd had died already. There was also one egg there. I but the 2 babies and the egg back in the nest and tried to put the nest back to where it was…was this what i should have done?? The parents havent come back yet and I am heartbroken as to what to do now. These babies are still very young, no feathers, eyes closed. Its sad when this happens. Any advice? Should I bring them in and try to feed them?? @Jamie: Odds are the youngsters are done for. You did the best you could, and no fault lies with you (it is NOT true that parent birds will reject nestlings touched by people), but when birds so young have been lying on the ground they don’t have much of a chance. I would not recommend trying to bring them in: it would be a ton of work and very unlikely to lead to success. @Emily: Your best bet is to try to find a bird rehabilitator. And, in the future, if you find a young bird that has parents coming to feed it leave it alone! HELP! I found this (so cute!) baby killdeer that is lost. I found it’s mom who is looking for the baby but i want to return it to it’s nest but i have no idea where the nest is. I haven’t seen any other babies, so, what should i do? Please answear. Hi Maddie – I completely understand your concern, but the very best thing to do is return the young bird to the area where you found it. Young Killdeers aren’t like robins or sparrows etc in that they don’t grow up in a nest: they are meant to leave the ‘nest’ (which is usually little more than a scrape in the ground so you’ll never find it!) almost as soon as they’re born. This gives them a chance to hide from predators (ground-nesting birds are very vulnerable to eg cats, foxes, crows etc) and learn how to feed for themselves by learning from their parents. Life is incredibly tough for small shorebirds like Killdeers but it really does stands a better chance of survival with its parents than without them. So… I have 2 dogs. a cockerspaiel and a Boxer, and there was a baby robin in my yard. While I completely understand that it is better for the parents to care for them, I have chased the little guy out of my yard all day just so that my dogs can go out. I finally brought him in and he is very young… younger then I had thought he was. he is still really pink under his wings and also has his “halo” still of grey feathering. I have cared for many other robins in the past with sucessful releases as well. but is it possible to take him across the road and down into the neighbors back yard, will the parents still come to him. @Alison: I have no idea: you can certainly try though. Good luck! I had a baby robin in my yard allday yesterday and the mom was following it around he could fly a little but stayed in my yard….well i found him behind the shed and all was fine…i checked on him a few times and then at one point he sat still and had his eyes closed looked like he was taking a nap! Then went back a few hrs later and he was dead not sure if he was sick or what he didnt look like he was attacked….any insight to this??! @SMO: No idea at all: sometimes fledgelings just don’t survive. Well thanks for the response….i seen the mom around him alot yesterday but as the day went on she wasnt around as much…..maybe she knew he was sick or something….but lastight had a robin calling out maybe it was her dunno but we picked the poor dead bird up and disposed of it…. again thanks for you response! I was at my sister’s and noticed a nest on the ground below a pine tree with a 4-or-5-day-old baby robin lying listlessly next to it. I put it back in the nest but noticed that maggots were already crawling all over its skin. A couple of hours later, I heard some chirping about six feet away from where I found the nest and walked around to discover another baby robin. This one too had maggots on him but appeared to be in much better shape. The first one died a few hours later, but it seemed like there was some hope for the second one. I decided to take him home with me, and after extracting the final maggots from his ears he seemed like a happy baby bird. On July 20th, he fledged — jumped out of his little cardboard nest on my kitchen window sill, and I came home that night to discover him chillin’ ‘neath the kitchen stove. Since then, he’s been hopping around my back yard, which he inevitably shares with my labs. I have a small, walled in urban backyard, maybe 125 sq. ft., though with many potted plants, among which he likes to hide, and a little compost pile from which I picked off some insects and worms for him tonight while he perched next to me. He has free run of the back yard during the day and stays out there in a screened-in dog crate to protect him from the alley cats that prowl around at night. After he begins self feeding, I plan to take him back out to my sister’s house for the final stage of his rehabilitation. I’d ask my niece to continue with the same routine until he no longer returns. She has a big yard that abuts a wooded area, which seems more ideal. 1) Do you think this is an ok plan? 2) If so, will the adult robins out there (maybe even his parents) attack this urban fledgling intruder? Also, will the transition from my little concrete jungle into the great wide open be too disorienting for the little fella? @Ellie: It sounds ok to me but I am not an expert on rehabilitating robins. I would contact a local wildlife rehabilitator and ask them were I you. And, no, I don’t think other robins will attack the little guy. Alright, thanks Corey. I will do that. my baby birds look like your skin right now.Just 1 layer of skin from the bottom.When i put a little stick beside its hole mouth opend like i was its mother. HaHa!!!! I just went to move a hanging fern and discovered a nest with eggs. So I immediately put it back in the same spot. Do you think the mother will return? @Deeanna: She should. Good luck! Hi! Just wondered how long mother robins feed their young when they leave the nest .how far can they go and mom still finds them do they die if mom doesn’t find them? i have a piece of advice for you if you find a couple baby birds or eggs and you know there mom is coming back for it LEAVE IT ALONE!!!! it’s like taking a baby from daycare you know a parent will come and get it won’t do you no good to take it and raise it like you would with a stray kid! Yesterday the wind blew a wreath off of our house, which held a robins nest. There were 2 very recently hatched babies, and 1 egg, which ended up cracking. We put the babies back in the nest, and the cracked egg near the nest, and placed the wreath near where it was hanging. The mother robin came back later that day and seemed to tend to the nest, but now is absent. Only 1 baby remains in the nest. Will the mother clean out the nest if the babies did not survive? How often must the mother tend to the nest? If she is absent all day long, does that mean that she has abandoned the nest? Is there any type of food that I can place in the nest to assist this baby? Thanks for your help…my daughter and I were very excited to first see the nest, and now are very sad by this outcome. A Robin had built a nest on our porch and four eggs hatched. She has been taking very good care of the babies. They had been getting much bigger. This morning we went out to check on them and none were in the nest. One was missing and three were laying on the steps not moving and appeared to have died. The nest was still in tack. We had had a thunder and lightning storm early in the morning. We thought we should bury them. When we went back out after getting ready onother one was missing. Would the adult Robins be taking them? The adult Robins are continueing to fly in our yard. Should we take care of the clean up? This has been a sad morning. Hi! Just wondered if the mother robin was killed by a hawk would the male still continue to sit on the nest and feed the babies or would he abandon the nest? Just trying to figure out why our 3 baby birds were dead in their nest this morning a hawk killed a robin close to the nest but I still saw a robin coming and going.We also had 35 degree nights and lots of cold rain I know your not a fortune teller but take your best guess……..
A Robin bird made a nest in one of my bushes and hatched four babies. They still did not have hair on them and were only about 2 or 3 weeks old. She was a good mother as we witnessed her feeding them worms. However this morning when went to check the nest (as I do every day) they where gone. Later this morning I discovered three of them dead on the ground and the fourth mostly eaten (my children and I are so sad by this discovery). What may have killed them? I was thinking a squirrel. Do you think the mother will use the nest again. I see her flying around almost confused as to where her babies are. I would like to explain to my daughters what may have happened. They where so upset today when they went to take a peek at the babies after school. Thanks for your help. 5 days ago two baby robins hatched in a nest on my 2nd floor back porch. The mother was taking very good care of them. She was on the nest keeping them warm this morning and I came home from work and the 5 day old babies are gone. There’s no way they flew out because they were still so helpless, eyes still shut. No humans touched them. Does anyone know if the mother or father may have moved them or is it more likely a crow or bluejay got them? I’m so sad, I feel bad for the mother if the babies were stolen by a predator. I wonder if she moved them. Would a mother move her babies? Also it got really cold overnight, in the high 30’s or so. Is it possible they died from exposure? I know she spent most of her time keeping them warm but she did venture out to get food a lot. Maybe the cold killed them? Mary- If the cold killed them they would still be in the nest the parents don’t ever move them. probably a crow or blue jay got them sorry for your loss I had three nests in my yard all three died for different reasons. Hi there, I could really use your help! It is a cold rainy day and I found a baby robin in my fire escape (big ole hole next to my basement window. The robin has wings, but verrry small back wings. I watched and it can’t fly to well just opens its wings and flaps around. I put it in my dog carrier cage with an almost wool like blanket….is this good enough? Should i go out and find some worms? It was chirping for a little, now it is taking a nap…what should i do? I made the mistake of not waiting to see if the parents come back but i didnt want it to stay in the rain n cold! Please reply as soon as you can! Thanks for your time! I forgot to tell you that it wasnt there over night, just fell a few hours ago! Rachel- If it’s getting close to night just keep it inside for the night because the parents go elsewhere. If you have any dog or cat food soak it in warm water a little or baby bird food from the pet store or some worms just don’t give him water you have to be careful how you feed them you can hurt them. But first you have to figure out how old your baby is compare it to pictures on the internet to figure out if he still needs to be in a nest or not and put him back out first thing in the morning near where you found him to see if his parents return to feed him make sure he is hidden not out in the open because crows or blue jays will kill him make sure the parents find him and if they don’t you will have to contact a wildlife rehabber in your area I hope this helped good luck! I found a baby robin about 2 weeks ago. My wife has fed her 20-30 times a day and she has grown and is flying around now. When we whistle she will come to us from wherever she is outside. However, last night she flew off and stayed her first night alone outside since we have found her. This morning at 7:40 am she was outside chirping and raising so much cain that it awoke me and I immediately woke my wife and we went outside, as we went outside she immediately jumped out of one of our shrubs and came to us and waited for breakfast: vitamins, night crawlers, and a special porridge my wife has been feeding her since we got her. I assume she is now about 3 1/2 weeks old. My wife and I are afraid she cannot feed herself, what should we do, When we lay stuff in front of her she won’t touch it. However if we pick up the same worm , she will readily accept it from our hands. We have named her(we just think she acts like a her) PEEP, like the marshmallow candies. We want her to be able to survive on her own, so what would be best to help her eat and learn to hunt. We have no problem keeping her and would do so, but that was not our plan, we wanted to let her be free, any advice ? Hi. We have a robin’s nest in bush outside….there were six eggs, blue with browish spots. 5 babies hatched last week, all cuddled up together, breathing, craneing to be fed. So cute! The adult was still around, but then they started to disappear. Yesterday there was just one, peeping audibly, now he’s gone too. And there is one egg left (proably not viable). They were just a week old, did not have feathers yet, just fuzz. Could the mother have moved them? Or did a predator get them? I’m sad that it’s most likely the latter scenario. Hi We have found baby robins and the momma and one baby was killed by a cat and I wondered if the daddy will feed the other 3 babies or not. If you could help me with this that would be great. Heidi- How old are they? If they are around 12 days old it shouldn’t matter a whole lot,but if they are younger they will probably not make it. It’s not unheard of the father taking care of the clutch but it is very difficult.If I were you figure out how old and see if the father is tending to them a lot if they are not close to leaving the nest very soon I would try to find a wild life rehabber in your in your area that can take them I’m not a professional But I just had the same thing happen to me, my babies were about 9 days old and the father was still feeding them but I think they were cold and hungry I went to check on them ,they were dead. I wished I had done more. I have an indoor cat and that’s why I don’t let him roam the neighborhood people need to be more responsible. Well access the situation fast because the can only go without food for a couple hours. carolyn- sorry to hear about your babies that it very unusual for their to be six eggs in the nest i think some other bird snuck some in? The mother doesn’t ever move them from the nest ,she probably abandon the nest because of predators.So yes I think it was the latter scenario. Sandy- GOOD JOB! on raising your baby that’s not easy,and a lot of work.No one else seems to be chiming in so my advice would be to contact a wildlife rehabber for some ways to make your baby more on it’s own, they usually bury worms with the end sticking out to teach them, try putting bugs and berries on the ground for him to pick up and maybe his feedings will become less frequent as he spends more time with his own,a good site to also check out is [wild birds ALL EXPERTS] GOOD LUCK! Can someone give me advice, hopefully soon? It’ nearly 9PM and a baby robin is in the middle of my yard. Mom or Dad Robin has fed it while I’ve been watching. I did not see the baby fly in and my concern is that now, being dusk, the bird will not seek shelter. I’ve tried to discern from all the submissions if I should help it, but I’ve not found a for-sure answer. Monica- If it has all it’s feathers and is a fledgling move it to the closest big bush so it can hide from crows and blue jays or hawks that will eat the little guy he’s a sitting duck in the middle of your yard, mom and dad will find him when he calls out and birds don’t abandon they young when touched thats a myth, if he looks too young to be out of the nest then you need to look for the nest he fell out of and put him back.So absolutely move him hope this helped! I am in tears right now. I’ve watched the whole process; from nest building to the 4 baby Robins’ leaving the nest for flight. 3 of the babies were gone yesterday, didn’t see them around anywhere. The remaining baby was gone today. Amazed that they’d be able to fly so well (since I hadn’t seen them in my backyard), I just assumed they were off to be adults. However, just before noon I heard the loudest squawking by what seemed to be 10,000 birds. I looked in my backyard and a feral cat was standing over the baby while the parents were screaming at the top of their beaks. I ran off the cat, however, now the baby (the only one alive, I assumed) took a flop not flight down the embankment in my back yard which is nothing but dense shrubs. All I could hear after that was the baby calling out to his parents and the parents searching with worms in their mouths. Now, I have been hearing the familiar calls the babies were making when the started to speak. It appears there is yet another one of the babies still in the tree where the nest was. He’s been calling and calling for the past 2 hours but it doesn’t seem the mom or dad is coming back. What should I do? @Kim: Keep the cats away as best you can and let nature take its course. So 2.3 weeks ago i found an abandon egg it had dead leaves on it it was blue and very cold, I thought it was a robin. so i took it and put it up against my body heat, bought it home. I made a home made incubator using: plastic cage, heating pad, tissue. And i laid the egg down in the incubator and turned it every 3 hours. I didn’t think it would hatch but i wanted to try. then i held it a little and then i on an accident made a hair line crack in it i was so sad. so my mom looked up what to do if that happens and it said, hair line cracks can be fixed with water glue. we tried it, last Monday at about 9:30 PM it hatched!!! it is five days old now eating and growing great. We have baby bird food, made for all baby birds… Question: what do i do when it is ready to go to the wild and will it be safe after being raised by me? Hi – My cat found a baby bird and I had him release the bird. I thought the bird would dye but I later found it chirping in one of my basement windows. I placed it in a green recycle bin with grass and put it in my backyard where there is some shelter. I fed it some worms and it turns out that the mother had found came back for it the next morning since it was chirping for the mother. I been covering it up at night with a screen and opening up the area for the mom to feed it. She has been coming to feed it faithfully. I have been keeping my cat in all day when it feeds but I’m wondering if I should continue this way until it fly’s out of the bin? Your help is greatly appreciated. Corey – It’s kind of hard to make a wild outdoor cat that you took in an indoor cat. I can appreciate your concern and this is why I try to keep him in during the day. Unfortunately, I did not find the information I was looking for to help this bird. hi, i had been watching 2 robins build a nest on my lattice, up high on my deck. then i watched as they fed their baby…went on for two weeks, very exciting. then one morn. i looked and the baby fell out of nest, at least 10 ft….and i then spotted it in the yard, just sitting there. it was chubby and it did hop, looked ok, i believe it was a fledgling….the parents were around alot.we have crows, owl, blujays..etc. so i moved the nest down under tree,put it in nest, and it jumped out and so i left it alone in the yard all day. parents still around, also when ihad picked it up, it had a mouth full of nesting material in its mouth, ipulled it out from deep in mouth. anyway i left the house for quite awhile and when we got back it was still sitting in yard chirrping a little and parents close by. left again, got back and it was dead.. dont know if parents fed it or not…it was not attacked by anything as far as we could tell..so sad..should i not have picked it up? i feel so bad….bird and animal lover …thanks. Sandi Decker- Is the baby bird moving, and does the baby bird look like it is injured? If it is injured it would be best to call a wild life rehabitator near you. Good luck! brenda- bee bee guns and boys what are people thinking! Hope your not using a heat lamp people never use the right way and the birds bake. use heating pad on low turn eggs every 2 or 3 hours .As for the one that has hatched soak some dog or cat food or baby bird formula in a pinch you could not feed them this diet for a long time it’s not a balanced diet you have to feed them every 20 minutes and call around for a wildlife rehabber I don’t know if he or she will take eggs,the faster you get the baby to a rehabber the better his chances are,it’s VERY difficult for the average person to do successfully, hopefully Corey may have some advice! yesterday my neighbor brought over a fledgling robin that was on the ground with her parents. they were able to pick up the fledgling and put her in a box, they did so because there are so many loose cats in the area and were afraid the cats would get the baby bird. they brought the fledgling to me. i read online about feeding them berries etc., and did so… about 5 or 6 mulberries and some tiny pieces of millet seed. it was fairly late at night around 7p.m. the fledgling seemed very sleepy at first when my neighbor brought her over. after i fed her, she did perch briefly on the box and pooped about 10 times. she was even fine with my holding her in my cupped hands for a bit. after a while i put her back in the box, in my bedroom with the light off so it would quiet and dark. this morning i woke up and she had died. is it possible she suffered a concussion when she fell out of the nest, which would account for why she seemed so sleepy and docile when the neighbor brought her over? if she had a concussion would she have still been hungry and eaten, and then pooped? we have a robin’s nest in our japanese maple tree with two chicks in it. we try our best not to come near it as the parents do fly in and out even when we are around. today, i noticed ants all over the chicks. i sprayed the tree trunk with ant killer but i was afraid to spray close to the nest. what else should i do? thanks. I have a baby bird on my belcony and its parents are waching it so im just going to leave it alone. Exsepet it has been there for 2 days so I have been feeding it without touching it. Im thinking of calling the wildliife rehabe if its still there tommorow. melanie- is the birds parents feeding it? and what are you feeding it? Can someone help me? I have a beautiful robin that decided to build her nest on top on air conditioning unit. I had to much heart to take her nest down and in the past couple months my boyfriend and I have just fallen in love with her. We live in Wisconsin and it gets ridiculously humid here. 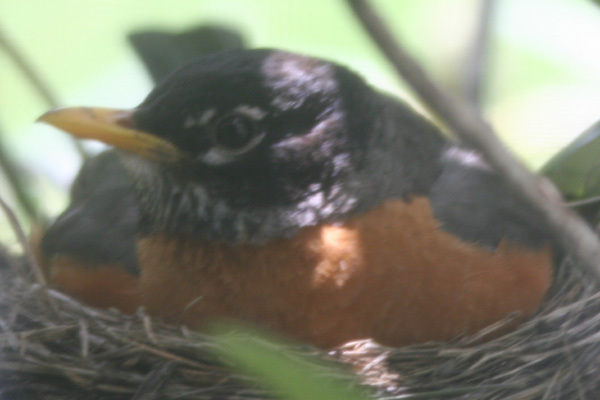 Can we turn on our air conditioning or will that kill our baby robins? Any info is welcome. had a very large old austrian pine removed this morning. 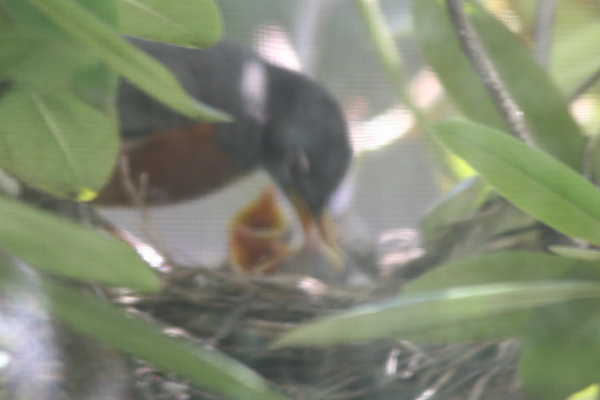 Unfortunalty a Robin’s nest with three …..looks like almost ready to go babies.” were “very gingerly” a victim. I have the nest in a safe place. I have been feeding them meal worms & suringeing little bits of waTER. They are robust & looking for food. Can I save them??? What advice…Help…Bird lover in ky.
And don’t give them water, it could be harmful (read the info in the link for an explanation). HELP!I found a fledgling robin baby and took it home because it couldn’t fly yet.I later found out that it was a better idea to have just left it there for the mom to protect and teach it on the ground.I have had it for a day and it probably smells like me.I want to take it back a.s.a.p but I’m worried that the mother won’t recognize it as her missing child. Should I still take it back now? I’d feel awful destroying its life by keeping it captive or leaving it to possibly die.Please tell me what to do! The idea that a baby bird will be rejected because it smells like you is a myth. Return the bird to where you found it. update, i watched three baby robins growing , and finally they flittered out of the nest , two in one day and one the next day, barely fledglings..anyway , they only flew a few feet in a small tree, watched them hop around and hide out, ma keeping an eye on them..a few days ago i saw the whole family flying around toegether, a happy ending to this story!!!j.k. bird lover…..
hello. Well this morning a neighbors cat attacked and mauled a baby robin in my backyard. I chased the cat away and the mom robin tried to attack me whle we put the injured baby in a basket in a tree. The baby bird was on the ground on his back and his wing was bloody. We were hoping that the parent would be able to nurse it back to health. All day long we saw the mom robin wacthing over the nest. We did not interfere again except to chase away the cat. Well about an hour ago my husband used a pole mirror to check the basket and the baby had passed away. We are devastated but we didn’t want to take the bird to a vet this morning since the mom was so protective and vigilant & clearly present. The problem is that the mom bird is still protecting the basket. I’d like to take the body down because it is a really sad reminder for me in the tree right outside my back window but the mom Robin won’t leave and still tries to attack us when we walk by. My question is: when will the mom leave? Since it never left this one, does that mean that she doesn’t have any more babies to go home to? How can I keep cats away from my bird feeder since some people just let their cats roam wild to attack animals in other people’s backyards? Hi there, We had a robin build it’s nest outside out bedroom window in the fern. The baby robin did hatch (only one) and was well looked after, then on Monday morning it was gone. My question is how many days old must they be before we know that they flew off by themselves. Please let me know – as I was enjoying watching this from the window. I found a baby robin underneath my porch at my house me and my little sister saw the mother robin hanging around on my fence so then i took the nest with the eggs in it so i walked with it and sayed here little mother robin but then the mother flew away so i felt really bad about them they were left alone in the rain so i put it in my garage to keep them safe so i could probely raise them with my sister Taylor but how when i saw it to begin with i walked out side with my dog to get fresh air outside i went down the stairs then my laces were undone then my dog barked at the mother robin!!!!! i sayed do not chase that mother robin then i looked up and i saw the nest and im like WOW!!!! robin eggs.and im going to name them emily and lisa jake and emma. Hi – I have a mother Robin that insists on nesting on the rafters inside my small porch – however this porch is the exit to my dog kennel which my 2 dogs use regularly – it seems ok in the daytime but at night she has flown out of her nest when I have had to go into the kennel to pick up the dog poop – will the Robin fly back at night, should I leave the porch light on – any advice welcome. we have the White-Browed Robin, White throated Robin, and the White browed Robin that I have seen nesting in our garden. They are such a pleasure. I had a robin and 4 lil babies that might’ve been a week old…she quit feeding them…could you tell me why you think she quit feeding them. She returned to the nest but I took a peek in the nest one morning and they were all dead. I assume she quit feeding. Do you have any idea what might’ve happened? Hey Nancy just re-read your post and realized that your dogs are always in the kennel and you don’t have to leash them sorry about that if you can clean up after dogs during the day so when she leaves the nest temps aren’t so cold. TARA-You sound like a very sweet girl but you shouldn’t have taken the nest and moved it anywhere not to mention that what you did is illegal all the eggs need constant incubating from mom and and even wildlife EXPERTS have a hard time getting them to hatch and live,even if by slim chance you got them to hatch they need a special diet that only the mother and father robin can give them and how to survive in the wild that we can’t teach them. I have a nest that had two baby Robins in it. Yesterday one of the Robins hopped out and the parents followed it to another yard. The other one is still in the nest and I have not seen the normally overprotective parents come back since. Do you think it has been abandoned? hey im only 16 and the only things i know about raising birds is what i saw on the movie Fly away home and what ive been reading in books and online, i also know what to feed birds and how to give them it. I dnt get up usually till at least after noon and the first thing i do is go out for a cig, well about a week and a half to 2 weeks ago i went out and i was walking towards where the front door is and i found a nest laying on the cement so i started looking around the yard for eggs and i found 2 1/2 two looked the same but one had a hole in it and there was half of a tiny random white 1. The one i found that survived was creamy white with brown spots all over and it was really tiny and we couldn’t figure out what it was, about an hour ago i compared the egg to a picture and it was an identical match to a wood warbler. Ive never seen these birds in our neighborhood b4 and i dnt really know much about them so i was wondering Can i feed it crushed earthworms or do i feed it something else? Also How often should i feed it every day? How long till it hatches? Any other tips advice or suggestions would be greatly appreciated Thanx! A baby Robin fell out of his nest. I figured the mom couldn’t to Anything about it.. So me and my friends Decided to keep it. I have 1 lamp surrounding it. He’s doing really well.He has his feathers. (I asume he’s a week old). Im not sure when to Release him..Could you help me? Layla You need to put the baby robin back now it will die if you don’t the and it doesn’t need a heat lamp you will over heat and dehydrate it fast do what’s best for the bird! Hi, I found your site and decided to ask you about the baby robin that I found in my front yard. I recently noticed a nest in one of our small evergreens and peeked in to see 4 baby robins. We were excited to have a nest so close to the house so that we could watch them. The next day, I peeked and noticed that one of the babies had fallen from the nest, so I put it in with its siblings. The next day, when I peeked at them, the nest was ravished, all the babies were gone and I was devastated. I know that crows are known to eat them, so that is what I thought. Later in the day, I went to the nest site, and found two babies dead on the ground, and one very hardy and chirping. I put him back on what little was left of the nest and it fell. I decided to bring it in and feed it, made a nest in a plastic bucket with a towel and some of the ravished nest. I had once worked for a nature center and raised 4 sparrows that I successfully released, but with this baby robin, I am afraid of not doing the right thing for it. I am feeding it babyfood beef mixed with Kaytee baby bird formula and is doing very well, but as it grows, what do I do? What does it need to learn from me? I feel badly that I got involved, and my heart took over my head. Help! Hi, i have successfully raised 5-6 robins in my lifetime, (i’m 52)….this is what i have learned…………robins are about the only birds i know of that allow their young to leave the nest before they can fly and continue to feed them while on the ground, so finding a baby robin hopping around the yard may seem concerning, but really is NOT…..with that being said, in my situation i have 7 dogs and 2 cats and baby birds bopping around the back yard is a recipe for diseaster :(….i think one of “my” successfully raised birds has built a nest on my deck, as she doesn’t seem bothered when i want to look and keep track of her eggs…………they have now all hatched and i will be soon zoning off the area with chicken wire to keep the dogs away (the cats will be kept in the house)………..i KNOW that allowing mom and dad to do their “thing” is the best for all………. well since posting this, I found a rehabilitation center to take the little robin. I know it was way too young to be on its own when it fell out of its nest. Something had to have disturbed the nest and that is why 2 and later, found the 3rd dead on the ground. I am glad that there are people out there who know what they are doing and can take these poor little things and give them a chance. I don’t think in the long run, that I did the wrong thing. I gave it a head start that its siblings obviously didn’t get. Hopefully, it has been released and is doing well. We had robins build their nest on top of our motion light right outside our front door about six weeks ago. We diligently started using the back door so as not to disturb them. The babies hatched, there were four of them, and mama and papa robin both protected their nest fiercely! Any time we tried to get the mail out of the mailbox that’s right underneath the nest we’d get dive bombed!! The last time we saw the babies was about a week ago, now it seems papa robin has left the area and mama robin just sits in the nest. We don’t think the babies are there anymore, either they flew off or were stolen by a predator, but it seems odd that mama is still there. We want to remove the nest but we were waiting until the babies had left and the family had abandoned the nest, but we still can’t get anywhere near it as mama is always sitting there. Is this normal? Why would she still be there if the babies are gone? Wondering how we can dismantle the nest and start using our front door again without upsetting mama? I found a baby robin in our pool he was still alive so i took him out and took him inside i got a box and towels and our turtle light and it warmed him up…i think his leg might be broke and he’s sleeping but he wakes up every 2 minutes and sneezes i think he has a cold we fed him wet catfood i have to wait till parents get home so i can buy worms i took twizers and fed him he ate 2 pieces thats it what do i do if he’s sick? ?and has a broken leg??? i wondering if you can help me ?, a baby robin fell out or a tree, but i dont know how to take care of it… we couldnt just put it back nhe nest was too high, and the mother wouldnt have botherd feeding it because we touched it… any suggestions ? My kitten got a hold of a fledgling robin. I rescued it and noticed it has a superficial injury to leg area. It it alert and trying to fly…yet not quite old enough. I placed it in a dark box with refuse from ground at bottom. It is in a quiet room now. I need to feed it but unsure how. I would put it back outside and keep cats insidse but with injured leg and not sure which tree it came from. Please reply what to do to feed. I think once I tend to leg injury and heals should be time it should fly. I found a baby robin 3 days ago. All 3 of them had fallen out of the nest and he was the only one who lived. Had hardly any feathers so I’ve been feeding him wet dog food and berries and so far so good he is doing well, eating about every hr on the hr except for late night. He has grow quite a few feathers over the past few days and don’t know when to start letting him out and about! I heard that whistling to them while you feed will help them come back for food when you start letting them learn on they’re own! Our yard is full of Robins so I hoping once I let him out one of them will teach him!